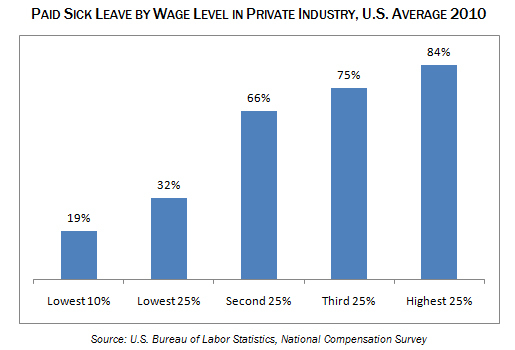 Nationally, over 80% of people who earn above the median hourly wage get paid sick leave, while only 19% do among the bottom 10% of earners. In addition to the short term financial losses from taking unpaid leave, people without sick leave lose opportunities for career advancement, and are limited in their ability to build assets, retirement savings, and longer term economic security. People who work part time frequently do not qualify for paid leave and other benefits that are provided to full-time employees. Women are far more likely than men to work part time, often for family reasons. 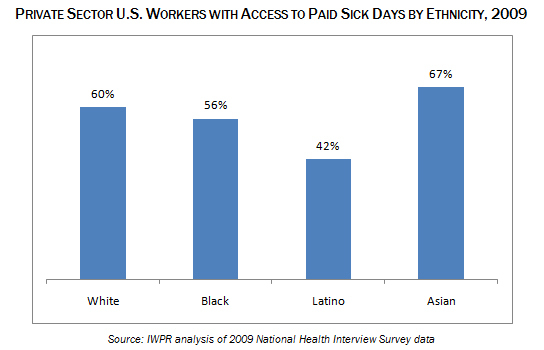 According to national data, Latino and African-American workers are less likely than whites and Asians to have paid sick leave. A 2010 survey of workers in San Francisco found that Latino and African American workers were more likely than white workers to report benefiting from that city’s paid sick days ordinance – by having more paid sick time available, their employers being more supportive of them taking time off, and/or being better able to care for health needs of themselves or family members. This entry was posted in Family values, Paid sick days and tagged ethnicity, federal poverty, Paid sick days, paid sick leave, poverty. Bookmark the permalink.